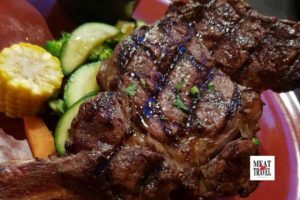 Volcanos Steakhouse Parramatta Review - 650g Rib Eyes & Much Meat! We don’t know where they got the name from but Volcanos Steakhouse in Parramatta certainly hits the spot. Arriving in Parra early we took a stroll up and down Church St, which is Parramatta’s main drag and home to many of its best restaurants. There’s a number of Steak joints including Meat and Co, but we wanted to try something new. We’re early eaters so we arrived at Volcanoes at 5:30 for dinner. Even still there were quite a number of tables taken up by hungry carnivores like us. All of those tables had food piled upon them and some massive drink vessels with taps bang in the middle of them. They call them soft drink towers and come in 2litre or 4litre. I’m not sure if they’ll fill them with beer for you, but you can ask. We took our seats and as per usual headed straight for the Steak list. Volcanos serve a number of steaks as well as rib combos. The steaks are all middle of the road “good quality” steaks. (keeping in mind the best steak you can get anywhere in Australia (possibly the world) is a 450 day grain-fed F2+ Wagyu at more than $250 a kg). A Carnivores dream. 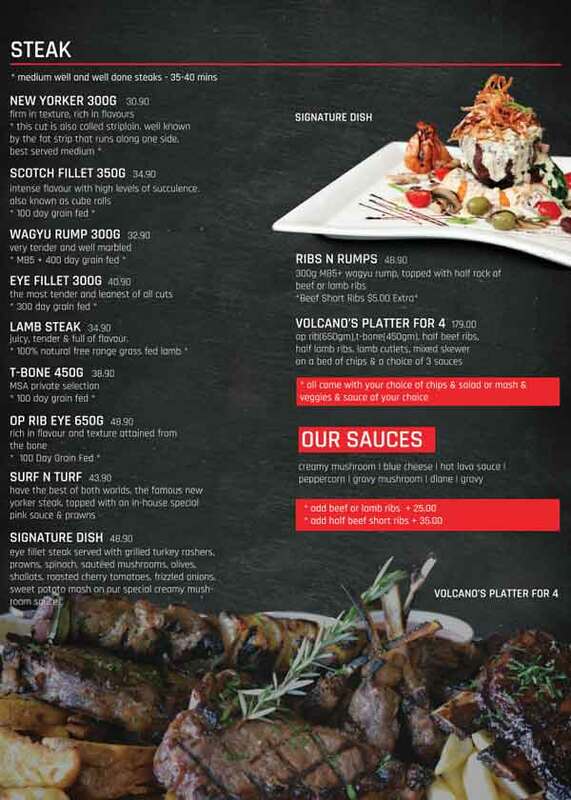 Volcanos Steakhouse Parramatta’s Steak Menu. Starting from a 300g New Yorker for 30 bucks, T-Bones, Wagyu Rump (I never ever buy rump I don’t care what it’s called) going up to probably their best steak in my opinion. A 650g Grain fed Rib Eye for $49 buckaroonies (guess what I got). Anyway, we ordered the 650g Rib Eye, it was juicy and well portioned, easily the claimed 650g. I opted for the fresh veggies and salad as a side and they were also well portioned and fresh. There was no room for dessert which is great as I don’t need any of that stuff before summer. Good quality middle of the road grade steaks. Again we only paid $50 for a 650g prime rib and it was well worth the money. Of course, you can’t expect a top of the line Angus or Wagyu that the restaurants would pay through the roof for, for under $50. For the price the steaks are fantastic. I think weeknights would be your best bet, Church St Parramatta is packed on the weekends. Get there the earlier the better and make a reservation if you know ahead of time. Next time we’re in Parramatta we’ll be back there for sure. I love getting a good steak that fills me up for a reasonable price, plus I want to try one of those drink towers they had going on there. Volcanos Steakhouse is on Church St Parramatta up towards the river end, if you’re from Parramatta it’s opposite the old David Jones building. This was not a paid review, they did not know were coming. We choose to review restaurants that we like. Most reviews at Meat and Travel are positive due to that fact that we don’t review restaurants that we don’t like. If we review a restaurant, pub, club or the like you can have confidence that we loved it. We review in fairness, considering: price, food quality according to price, atmosphere, and friendliness of the staff. We loved Volcanos Steakhouse Parramatta! Restaurant Description: Big Juicy Prime Ribs, wide selection of Steaks and Meat Platters on Church St Parramatta. We loved the 650g Rib Eye and atmosphere. We don’t know where they got the name from but Volcano Steakhouse in Parramatta certainly hits the spot.